WASHINGTON, Feb. 4, 2019 /PRNewswire/ -- Wounded Warrior Project® (WWP) announced support of The War Horse to host writing seminars to empower veterans to tell their stories. WWP's $50,000 grant will provide participants a chance to hone their writing skills during the 2019 writing seminar at the Boulder Crest Retreat Virginia, a privately-funded posttraumatic growth-based wellness center located in Bluemont, Virginia. These seminars create an environment where veterans can reflect on their military experiences, discuss their personal stories, and turn traumatic events into effective leadership tools to help themselves and others. 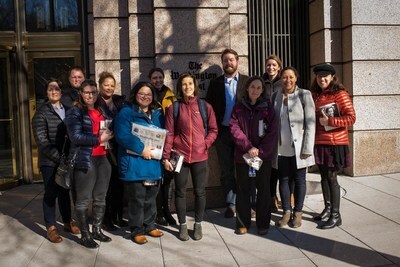 The War Horse is an award-winning nonprofit newsroom focused on the Department of Defense and Department of Veterans Affairs. "It's a common misconception that veterans don't want to talk about their experiences in combat," said René Bardorf, WWP senior vice president of government and community relations. "Through this grant, we are proud to help The War Horse connect some of today's best writers with the most promising veteran authors of tomorrow. So many important personal accounts remain untold, and this grant will help these deserving medics and corpsmen connect, reflect, and share their experiences with the world through the cathartic act of writing and storytelling." "We're proud to partner with Wounded Warrior Project to help combat veterans find their unique voices and tell the stories of their service," said Thomas Brennan, Marine Corps veteran and founder of The War Horse. "The War Horse Writing Program nurtures the next generation of military writers to share deeply personal stories as a means to foster a more robust conversation about the experience of war, something our country needs more than ever." Boulder Crest, an innovative nonprofit that designed and delivers the first ever programs designed to cultivate and facilitate posttraumatic growth for veterans managing post-traumatic stress disorder and combat stress, is working with The War Horse to host these events. Since 2012, WWP has partnered with over 120 organizations involved in the care of America's military community by providing more than $74 million in grants. To learn more, visit https://wwp.news/Newsroom.